In need of an additional gift that you can speedily knit? - then this is for you. (Unless you live in the tropics, when it would probably never be for you). I made these mittens to go with the beret Featherbed by Louisa Harding from her book Little Cake . I like Louisa's work, and yarns; however, I made her beret in Rowan Kid Classic as I needed a particular colour, and in consequence had sufficient left to make mittens, using a similar stitch pattern. Using Kid Classic was fine but made for an even more lightweight beret - I think I would like to try the recommended yarn for a slightly bulkier feel as intended. The mittens are lovely and warm and .... feathery. Cast on 36 stitches, arrange evenly over 3 needles. 1st round: * K3, p1, k1, p1; repeat from * 6 times to end of round. Repeat round 1 three more times. 7th and 8th rounds: as 1st. Repeat rounds 5 through 8 four times more times. 23rd round: * K3, p1, k2, p1; repeat from * 6 times to end of round. 24th round: * K3, p1, k2tog, yon, p1; repeat from * 6 times to end of round. Repeat rounds 23 through 26 three times more times. 39th round: * K3, p1, k2, p1; repeat from * 5 times. Then: k3, p1, k1. Using waste yarn, knit the last 2 sts of the round. Slip these 2 sts back onto the left needle and knit them again using working yarn. Repeat rounds 23 through 26 twice more. Cast off 42 sts (not too tightly). sts below the opening, that look like normal sts, and aim to get 8 sts above - ensure you pick up all the loops. Now set off working in a round; starting with the 7 sts below the opening, arrange the sts as follows: Place the first 2 sts on a needle and leave for the end of the round. Join in the yarn and using another needle, k3, p1, then k2tog (the last of the 7 lower sts and the first of the 8 upper sts), yon, then purl the second stitch from the upper needle. This is "needle one" and has 7 sts. Using another needle, k1, k2tog, k1. This is "needle two" and has 3 sts. 3rd round: * K3, p1, k2, p1; repeat from * once to end of round. 4th round: * K3, p1, k2tog, yon, p1; repeat from * once to end of round. Cast off 14 thumb sts loosely. 1 x 50g ball Rowan Kid Classic. Small length of waste yarn in contrasting colour, (something slippery like cotton preferably). One set of 4 No. 8 (4 mm) needles. Kid Classic knits to a tension of 18sts and 24 rows to 4 inches on 6mm needles. Width all round above thumb, 7 ins. To alter the size use larger or smaller needles as required. 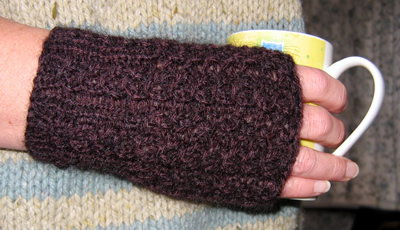 yon: yarn over needle - makes an extra stitch which forms a small pattern hole when knitted on the next row.